With the first test wrapping up at the Adelaide Oval today, I was thinking back to the glory days when Richie Benaud, Tony Greig, Bill Lawry, Ian Chappell and sundry used to call the cricket on Channel 9 and they would often refer to the Adelaide Oval as “the prettiest cricket ground in the world”. Source: Serendigity’s Photostream on Flickr. 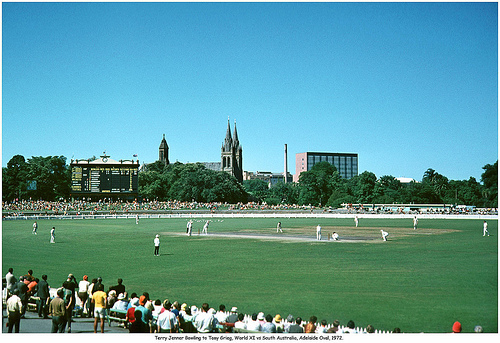 My favourite photo of the ‘world’s prettiest cricket ground’ taken in 1972. I’m sitting here remembering a twilight cricket game on a balmy Adelaide summer’s evening, with the Hills in the distance, the church spires above the Moreton Bays, the noisy crowd on the hill and the majestic old scoreboard, ticking over as Australia scores another two runs. I’m home, this is Adelaide! Don’t get me wrong, I love the new Adelaide Stadium and what it’s doing for the city, but it’s fun just to think back and recall the old oval and how pretty it was back then. Growing up listening to cricket commentators from all over the globe, it was not at all uncommon to hear them describing the beauty of the Adelaide cricket ground, falling into raptures about the colour and the view over the “cathedral end”. Some of the world’s greatest players celebrated their finest performances there including Sir Donald Bradman, who in 1931—32 recorded the highest score at the ground in Test Cricket, compiling 299 against South Africa. In the same game, Clarrie Grimmett collected 14 wickets, the most taken in a Test match at the ground by a bowler. Bradman went on to become the greatest batsman in the history of cricket and the Bradman Collection has a permanent home now at Adelaide Oval. Another of the great cricketing occasions in Adelaide Oval history (and there have been many) came when in 1982, South Australian captain David Hookes ripped apart a Victorian attack after being angered by the Victorians’ delayed declaration and scored 243 runs from 254 balls in a Sheffield Shield game. He made the fastest century in first-class cricket in just 43 minutes from 34 balls. Many believe it to be the greatest innings played at the Adelaide Oval. It was certainly the fastest! Source: Channel 9. David Hookes during his record-breaking century against Victoria in 1982. As a football ground, some of the most exciting and ferocious finals and grand finals ever staged in the SANFL took place there. If you were born in the ‘boomer’ years you’ll probably have fond memories of going to Adelaide Oval on a Saturday afternoon (footy was only played on Saturday afternoon then) and watching the local footy heroes in what was then the elite level of the sport. The great teams of the era and the legendary rivalry between them, Port and Norwood, Sturt, Glenelg, South Adelaide, West Torrens, North and West Adelaide. Adelaide Oval has been the home to both football and cricket since its formation in the early 1870s and there have been many great times to remember and celebrate. History will, I’m sure, continue to be made there. There was an incredible win today by the Aussie cricket team and an amazing twelve wicket haul from Nathan Lyons in the first test, and with the strong rivalry that now exists between Adelaide’s two AFL footy teams, Port Power and the Crows, we will continue to see the Adelaide Oval remain as one of the nation’s great sports stadiums. It wasn’t just the cathedral end, either. Looking up the other way, the city looked very pretty, too, especially at night. Went to several concerts there, and loved the surroundings. Yes, the new oval is great, I just wish it could be somewhere else! Why do you call the Port Adelaide Football Club; Port Power, when their nickname is the Power and that requested by the club…yet you don’t call the Camry Crows…” The Camry Crows”… ?